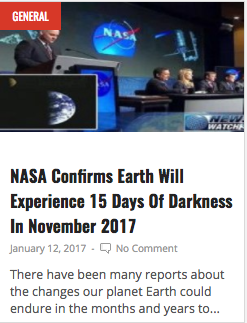 NASA Warns of 15 Days of Darkness in November 2017-Fiction! - Truth or Fiction? NASA Warns of 15 Days of Darkness in November 2017-Fiction! NASA has confirmed that there will be 15 days of total darkness in November 2017 because of an astrological event caused by Jupiter and Venus. A false report that NASA has confirmed that the earth will experience 15 days of total darkness in November 2017 is the latest variation on a long-running hoax that has proven false many times before. Similar claims that there would be 15 days of total darkness were made in November 2015 and in June 2017 . They both proved to be false before the most recent version, that earth would see 15 days of total darkness from November 15 to November 30, emerged in August 2017. According to experts this blackout will be caused by an astronomical event between Jupiter and Venus. There was even a detailed 1000 pages document written by Charles Bolden, head of NASA explaining the strange event to officials at the White House. According to the report, during this specific period Jupiter and Venus will come in close proximity of each other and will be separated by just 1 degree. Venus will move to the south-west of Jupiter and as a result it will shine 10 times brighter than Jupiter. Venus’ bright light will heat up the gases in Jupiter causing a reaction which will release a an absurdly high amount of hydrogen into the space. This reaction will come in contact with our Sun at 2:50 am on November 15th. From Washington, the pair will be difficult to observe as they will appear no higher than 8° above the horizon. They will be visible in the dawn sky, rising at 06:03 (MDT) – 1 hour and 9 minutes before the Sun – and reach an altitude of 8° above the south-eastern horizon before fading from view as dawn breaks at around 06:54. Venus will be at mag -3.9, and Jupiter at mag -1.7, both in the constellation Virgo. In the end, the Conjunction of Venus and Jupiter will bring a rare opportunity to see the planets close together in the night sky, but there won’t be 15 days of total darkness in November 2017. Reports that the earth will experience 15 days of darkness in November 2017 are false. Charvat vs. Carnival: Class Action Lawsuit for Free Cruise Robocalls-Truth! Charlottesville Police Were Told to Stand Down During Protests-Reported as Fiction!